Israeli Prime Minister Ehud Olmert has announced he will stand down within months, saying a corruption case involving him is hurting his family. Vowing to prove his innocence, he said that he would quit as leader of his Kadima party as soon as it elects a new leader on 17 September. He will remain caretaker prime minister until a new government is formed. 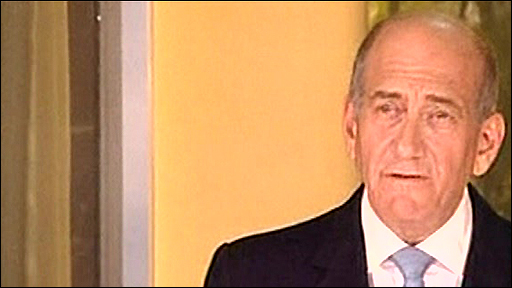 Mr Olmert had been under pressure to resign over a police inquiry into money he received from a businessman. The corruption inquiry centres around allegations that a US citizen, Morris Talansky, made election donations in cash to Mr Olmert in 2006, which may have subsequently been used to buy luxury items. Mr Olmert has already denied all wrongdoing. The prime minister had faced mounting pressure from within his own party to resign and it had become clear that he would have been humiliated had he stood in the September ballot, the BBC's Wyre Davies reports from Jerusalem. Many analysts say Mr Olmert's weak political position has severely impaired chances for a peace deal with the Palestinians by the end of the year, our correspondent adds. A spokesman for Palestinian President Mahmoud Abbas said the announcement was "an internal Israeli matter" and that Palestinian negotiators still hoped to reach a peace settlement before the end of this year. The US state department said that peace negotiations would continue and that it looked forward to "working with all responsible Israeli leaders in the government". Syria's UN ambassador said the resignation might affect indirect peace talks with Israel, which are being brokered by Turkey. "It could do. I hope not," said Bashar Ja'afari told Reuters news agency. The scandal is one of six corruption investigations Mr Olmert has faced during his time in office. "What is more important, my personal justice or the public interest?" Noting that the investigation was turning people against him, he said that "people hurting my family bothers me a lot". He complained of "relentless attacks from self-appointed 'fighters for justice' who sought to depose me from my position, when the ends sanctified all the means". The Israeli prime minister also seemed to direct veiled criticisms against the justice system, saying "the prime minister is not above the law but he is in no way below it". "I am proud to be the prime minister of a country that investigates its prime ministers," he remarked. Foreign Minister Tzipi Livni, one of Israel's most popular politicians, is tipped to replace Mr Olmert in the party contest. This is a good move and long overdue, Olmert is a weak PM in a country that cannot afford to have weak leaders. A former protege of Ariel Sharon, she helped broker Israel's withdrawal from the Gaza Strip. She is viewed as one of the few centrists in the government not tainted by corruption, and champions a vision of Israel co-existing with a Palestinian state. However, critics argue that she lacks the military and political experience to lead the country. Shaul Mofaz, Avi Dichter and Meir Sheetrit are also seen as contenders for the party leadership.